Whether you want a majestic gateway to your outdoor space or a sleek, minimalistic patio door, Renewal by Andersen® of St. Louis has you covered. We carry a wide selection of elegantly designed Andersen patio doors and can help you find the one that suits your lifestyle. Here are more reasons you should go for our patio doors. Choose from either elegant French doors or innovative sliding glass doors. If you’re artistic, check out our art glass. If you want more privacy, go for patterned glass. We’ll work with you to choose among our attractive patio doors in St. Louis, based on your style, budget and spatial constraints. Most homeowners are concerned about the track of their sliding patio doors. When you choose an Andersen unit, you don’t have to deal with doors that stick or come out of their track. Our doors slide smoothly along the track and are easy to maintain. The door comes free when lifted, allowing for quick, easy upkeep. Andersen provides long-lasting patio and entry doors in St. Louis, MO. Our doors are not prone to cracking, warping or weather damage. They’ll remain beautiful and energy-efficient for many years to come! 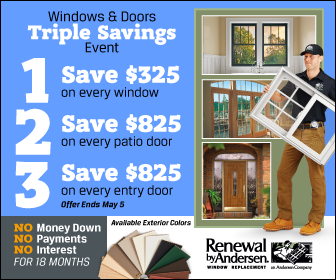 At Renewal by Andersen of St. Louis, you can be sure of top-notch installation. Our team has undergone extensive training, learning the ins and outs of the br and’s installation process. This training allows us to back each patio door we install with Andersen’s industry-leading warranties. Our catalog features an array of sliding and hinged entry and patio doors. You can customize these with various glass options, hardware and other additions. We also carry a range of durable, attractive and energy-efficient windows. Let us help you enhance the energy efficiency of your home with new windows and doors! Call us at (314) 332-2364 today to schedule your consultation.